This is a really niche topic of discussion. Those who have both practiced software development and played/studied Go may appreciate the relation. If you’ve never played go and are not a software developer… well I can’t really help you there. However, today I found the similarities astounding. There are a lot of terms from Go that are used to describe the game or situations in the game. Things like “lightness” and “flexibility” where your stones are spread out to cover a larger area but with gaps in the middle. The idea being that since they are spread out you’re not too attached to any one stone and can adjust your battle plan by sacrificing a single weak stone rather than being forced to protect a large group of more valuable, and yet still weak, stones. If you cluster your stones together too much, especially at the beginning, you’re said to be over concentrated and are not being very efficient with your stones. Your stones can become “heavy” when they’re too large to lose, but very difficult to keep from being captured. You are forced to make moves that benefit your opponent more than yourself just to make sure you don’t lose those heavy stones. Japanese style floor goban. 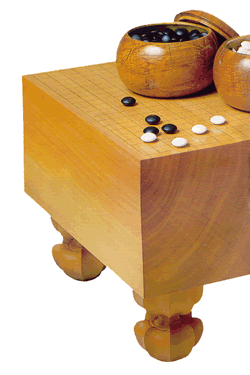 Large board tables like this are often made of Kaya, a rare japanese tree known for it's properties as Go board. They are often very expensive. What does this have to do with software development? Quite a bit actually, especially if you follow the Agile Development Methodology. When creating a software design, you will be more rewarded if you keep your design light and flexible, able to adapt to new change as it happens. The ability to sacrifice (refactor) a weak section will help your greater strategy of winning (producing a complete product). When pieces of your development get heavy, they are difficult to refactor, possibly because they’re not designed to be tested. When modifying that section of your code, it tends to break other sections. Since you built a bad foundation early on and refused to sacrifice it (refactor), you end up being stuck trying to save a dying design and spend a lot of time and effort for little gain. Once you’ve sacrificed enough bad designs and followed your test driven development to the proper design, your code becomes flexible and more maneuverable. In Go terms, sections of it become “Alive“. Building off of those sections, as long as you keep to your design principles, makes fixing bugs and developing new structures a lot easier. There are several ways to play go. There is speed Go, where you give yourself only a few seconds to play your piece. There is Go played with a normal time limit, usually an hour or so for each player with some overtime after that. And there’s games which are not timed at all. Speed Go often results in a lot of mistakes, however you can finish a game a lot faster. The result won’t be the best however, and you wouldn’t want to use it to represent your skill in the game. Regular Go is what is good enough for most people. You spend a reasonable amount of time thinking about most moves, but in general you rely more upon any experience you have than reading out the board. In an game that isn’t timed you can really sit and concentrate on your move. You might think about dozens of possibilities of what you could play and the replies your opponent can make and future moves you would make to those replies, etc. It can take a long time, but the resulting moves can be brilliant at times, and often will result in the best game. I find that too many people play Speed Go in their development efforts. They’re told “Fix this bug” or “Make something that does this” and they open up their IDE or programmer’s editor or echo and cat and put some code in files trying to solve the problem as fast as possible. Problems are dealt with as they come up. There isn’t really a design per say, just how the code all comes together. The problem with this is that the code created by Speed Code is often very problem specific and difficult to fix and modify. There’s no flexibility, and often pieces of the code are heavy. The last form, coding without a time limit, can yield some surprising results. I’m not saying that you should give everyone unlimited time to code even the most simple of things, nothing would get done. Nor should you try to get the “perfect” design before coding anything, as what you’ll get in the end won’t be worth the time spent. Rather I think that, especially at the start of the project, some actual thought should be put into what you’re coding. This thought shouldn’t be just in your head however, it should be in the form of Tests. If you write up tests that utilize the code you haven’t even written yet, you can get a good design before you code. If it seems hard to test, try something else. You should be writing and throwing away tests as you work on the design of the piece of code you’re tackling. This is equivalent of reading ahead moves in a Go game, seeing where the pieces might lead. Of course there’s only so far reading ahead will get you. Soon enough you’ll have to implement what you’ve designed and look at the next piece. However, don’t assume just because you have tests and an implementation and that they all work that you can’t change them any more. Everything you write should be flexible to be rewritten or refactored and thrown away or modified to handle new business rules or requirements. Having the tests in place will make modifying the code easier as you’ll see where things will break and can modify them accordingly. I noticed this correlation in my own code just today. I was finishing up an implementation before moving on to the more difficult part of my project when I realized that from the structure I have built up and the loose framework that I’ve designed, the “difficult” part of the project was able to be solved in the framework that currently existed. The same framework that I’ve built up and torn down and built up several times over the past few months. This entry was posted on May 14, 2010 at 3:15 pm and is filed under Baduk, Design, Go, Ramblings. You can subscribe via RSS 2.0 feed to this post's comments.